There are innumerable sales tools out there. The truth is that you only need about 15 of them for your sales tech stack, so you can drastically increase your sales productivity and the velocity of your sales pipeline. When done correctly, the majority of these tools should work seamlessly together. We have a simple and quick process at SellPersonal for choosing tools with which we build SellPersonal Sales FlyWheels—we call it the Sales Tech Stack 2-Step. The U.S. alone spits out 2.6 gigabytes of data every minute! Your sales team has to be equipped to keep up with the pace of business today or their productivity will fall and your sales pipeline will become wildly inconsistent. Every sales tech stack we build at SellPersonal begins with a solid foundation. That foundation is the Google Chrome browser. In fact, the first three tools with which we start our SellPersonal HookUp Sessions are Google products in Chrome, Gmail, and G Suite. 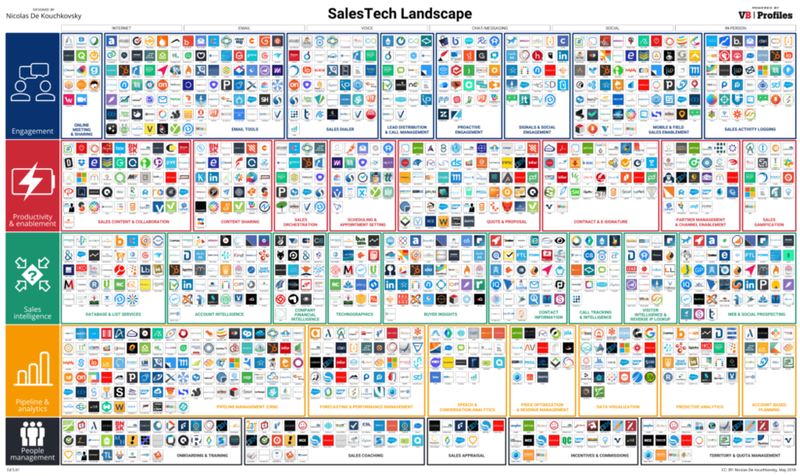 Your company and sales team are at serious risk of falling behind if they're not starting their sales tech stack with these three products. The majority of primary and secondary schools in the U.S. are equipping their students with Google Chromebooks, which means the future workforce will all be trained on Chrome, Gmail, and G Suite. And while it's a long way from taking over the kingdom from Microsoft, it's getting large enterprises to switch with regularity. I was recently at the AIIM Conference, where one of the IT leaders for a global financial brand said, "It's not impossible that within the next five years, we may have to train college graduates on how to use Microsoft Word." Dying Company: "Which software will run on my Windows or Mac operating system?" Adapting Company: "How much RAM do I need to make my Google Chrome browsing experience fast?" Regardless of your allegiance to Microsoft, Google, or Apple, the majority of work we do is done inside Google’s Chrome browser. Think about it: How many pieces of software do you use that are not cloud-enabled and accessed directly from the browser? In my entire tech stack, I only have one piece of software that runs outside the Google Chrome browser, and that is video conferencing software called Zoom. I can even directly integrate Zoom with Google Calendar, so the only time I touch Zoom’s software is when I actually run meetings. These are literally the only icons on my MacBook Pro’s Dock. When you look at the tech stack diagram above or the spreadsheet of our recommended tech stack by business size, you can see we simply call the middle of the stack "tools" because these are largely interchangeable and constantly changing. In short, use the Google Chrome Browser. If you don't use G Suite for business, including Gmail, you should have a really compelling reason not to do so. Step 2: Choose tools based on functionality and the technology vendor’s depth of expertise. Here is where everyone usually overdoes it with the plethora of available and constantly changing sales technologies. The second step of this process actually includes seven sub-steps. You need to do these seven things quickly to select the right tools to add to your tech stack. Go to the G2 Crowd Top 100 list here. Choose the tool or category you think best fits your needs. You'll see the G2 Crowd Grid pop open. Choose your business size (small, mid, or enterprise). Once you have chosen your business size, choose three technologies from the "Leader" quadrant to compare. You're only looking for core functionalities, not add-ons. For example, if you're looking for a Team Collaboration tool, then look at Slack for the ability to chat quickly. Yes, it also has conference-calling functionality, but that is an add-on for them, not its core functionality. Does it have an API? In short, can you connect this tool to other data sources easily? Is the UX (user-experience) strong? Sign up for a free account or demo if you need to. Spend no more than a week testing the sales technology for your needs. Be sure at least two sales people get to try it out. Sign up, hook it up, and get your sales team trained on it. This is all you need to quickly build a sales tech stack that will enable your sales team to rapidly increase the velocity of their sales pipeline.